Clark Model U.N. participants at the Columbia University Model United Nations in New York conference included Yohan Senarath ’14, Corie Welch ’17, Patrick Burchat ’15, Dulara de Alwis ’14, Migel A. Lara ’15, Doga Bilgin ’16, Mariale Poleo ’15, and Themal Ellawala ’13. If you happen to know someone on the Clark University Model U.N. team, you know they’ve spent the past month collecting accolades. With three competitions behind them, they are readying for five more, and a conference that will attract hundreds of High School Model U.N. participants from around New England to Clark. From Oct. 3 through Oct. 6, Clark’s Model U.N. team participated in the Columbia University Model United Nations in New York (CMUNNY). Corie Welch ’17 and Mariale Poleo ’15 earned Verbal Commendation awards and Doga Bilgin ’16, Dulara De Alwis ’14 and Yohan Senarath ’14 were given honorable mentions. Themal Ellawala ’13, Miguel Lara ’15 and Patrick Burchat ’15 also participated in the conference. Teammates Bil Carter ’15, Sheila Qamirani ’15, and Beliansh Assefa ’17 won Outstanding Delegate Awards at the Boston Area Model United Nations (BarMUN) Conference. Justin Lewis ’16 and Garret Lynch ’16 both earned Verbal Commendation Awards for their performance. Other Clarkies who participated in BarMUN include Michael Pierce ’16, Yuki Oh ’17, and Steph Vachon ’16. 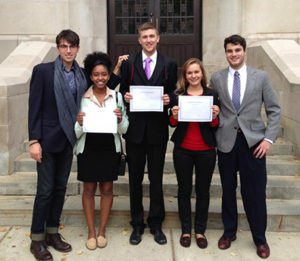 Doga Bilgin ’16 won outstanding delegate at the Security Council Simulation at Yale University (SCSY). Other students who participated include Miguel Lara ’15, Shane D’Lima ’14, Mariale Poleo ’15, Dea Dodi ’17, Dylan Sansone ’14, Jake Kailey ’14, and Themal Ellawala ’17. Meanwhile, the group is getting ready to host its annual High School Model United Nations Conference on campus on Nov. 9; approximately 150 students from the New England area are expected to participate. 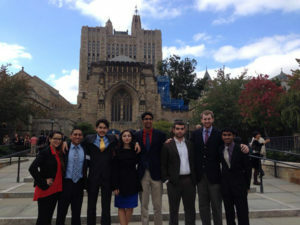 Participants in the Yale University Security Council Simulation include Mariale Poleo ’15, Miguel A. Lara ’15, Doga Bilgin ’16, Dea Dodi ’17, Shane D’Lima ’14, Dyan Sansone ’14, Jake Kailey ’14, and Themal Ellawala ’17. 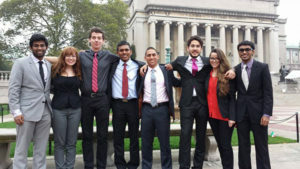 They will take a short break before heading to the University of Pennsylvania Model United Nations Conference (UPMUNC) mid-November. The season will conclude within an all-day Genocide and Humanitarian Crisis Simulation, focused on Syria, on Saturday, Nov. 23. “The Clark Model U.N. Team consists of highly motivated members. They are absolutely driven and want to do the very best and compete with peers at other top schools,” said Professor Srini Sitaraman, who has served as the faculty adviser and instructor since 2003. The Clark Model U.N. program is sponsored by the Political Science Department and supported by the Clark University Student Council.